This month's Japan Times column is mainly about the difference, at least in Japan, between kanten and agar. Although in other countries kanten (a gellying agent that's been in use for centuries in Japan and is derived from a type of seaweed called tengusa) is called agar or agar-agar, in Japan agar and tengusa are two different things. Read on and find out what that difference is!. Incidentally, regular agar powder sold in most places is the agar described in the article - in other words, not kanten. Although kanten is available in powdered form, which is rather easier to use than the traditional block type, if you want to be totally sure you are using kanten, get a block from a Japanese grocery store. In most jelly-like recipes though you can use kanten or agar without a problem. 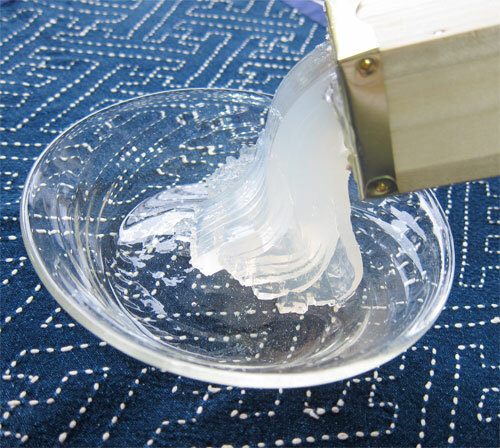 Tokoroten will have a not-quite-right texture if made with agar though. 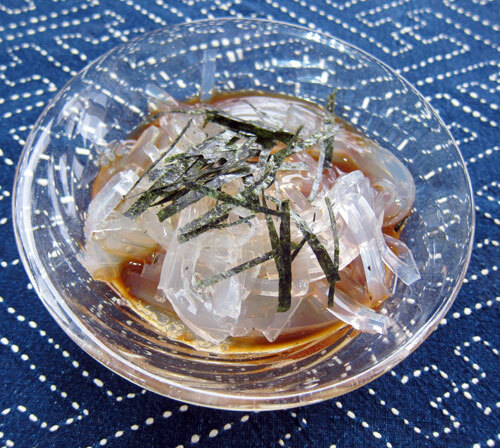 The Japan Times article also has a recipe for tokoroten, the clear-as-glass slippery noodles that are fixture in the summer months in Japan. These are not the same as shirataki or "miracle" noodles by the way, but as also almost zero-calorie and packed with water soluble fiber, the type that's supposed to be quite good for your guts, help to fill you up and prevent you from overeating, and so on. Although tokoroten noodles can't be cooked (they'd just dissolve), you can use them in salads and the like, and they never have that offputting odor that packaged shirataki noodles have. 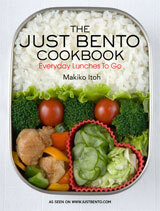 You can buy ready to eat tokoroten packs at Japanese grocery stores if you don't want to make your own. 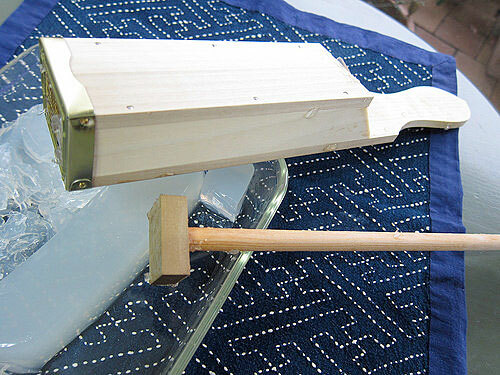 I also mention that tokoroten is made with a tool called a tentsuki. Here's how one looks like. 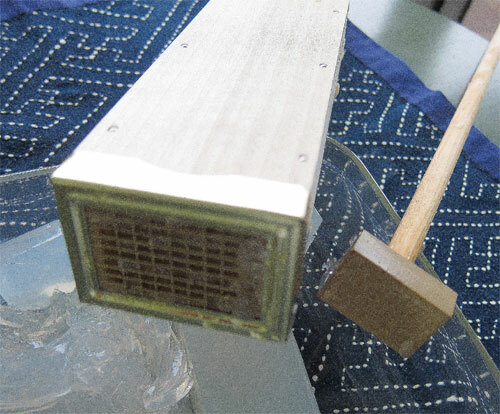 It consists of a box that's open on one end and has a grid on the other, and a stick with a flat board on one end. The basic form of tentsuki haven't changed at all since the Edo period, or from the late 17th century or so. This is the business end of the tentsuki, with the grid. The tentsuki pictured here cost around 1800 yen, but you can get plastic ones that work just as well for a couple of hundred yen or less, or metal ones for around 6-700 yen. (There are also cheaper wooden models, but personally I would go for a nice plastic or metal one if you are on a budget rather than a cheap wooden one, which may not be as sturdy or well made.) They aren't commonly sold elsewhere though...so if you really want one you will have to get it from Japan most likely. Pushing the kanten jelly through the tentsuki is one of the most fun and satisfying things ever. Because of space constraints, I couldn't include a recipe for the sweet version of tokoroten. I actually didn't know until a few years ago that tokoroten is eaten with a molasses-like dark brown sugar syrup, and sometimes kinako (toasted soy bean powder) too, in some regions of Japan. Growing up in the Tokyo area I only knew the vinegar-soy sauce version, which is the version that's been eaten by locals since the Edo period. Nowadays I avoid sugar as much as possible so the brown sugar version is out for me, but it's really nice if you like sweet things. Making kuromitsu is really easy. Use the darkest brown sugar you can find - muscovado should work fine. Combine the sugars and the water in a small pan, and heat over low heat while stirring. Keep stirring until the sugars have dissolved and you have a smooth syrup. Serve over tokoroten noodles or other Japanese sweets, on pancakes, and so on. Add some kinako (toasted soy bean powder) over the tokoroten noodles and syrup if you like. Submitted by maki on 2014-06-18 07:31. Not even remotely authentic, but I bet maple syrup would make a nice variation on sweet tokoroten. Might want to dilute it with some water or it could be cloying. Coconut milk could give tokoroten a SE Asian spin. Personally, I prefer the more refreshing version with shoyu & vinegar. Now that I'm thinking about it, I wonder how it would be with balsamic vinegar. It sounds weird, but shoyu and balsamic vinegar go well together! I'll have to give it a try. Wow, nice recipe. I like sweet things so I would like to give it a try. Thank you for sharing. Where can I buy the tentsuki in the United States? I have been looking for this. I have the same question as Thuy. I'd love to do my best to recreate this, but I'm having trouble finding the ingredients in the US. Is it safe to order online and have them shipped? Salam super, Might want to dilute it with some water or it could be cloying..